The ARD (Atmospheric Reentry Demonstrator) was an ESA program that developed an unmanned Apollo shape capsule that performed a sub-orbital atmospheric reentry for demostration of applied reentry technologies and atmospheric reentry data recording purposes. The project was part of the developmental work for a future european manned capsule. It was launched from Kourou, in the French Guiana, in 1998, onboard an Ariane 5 rocket, performing a succesfuly reentry from orbit and splashdown in the Pacific Ocean. 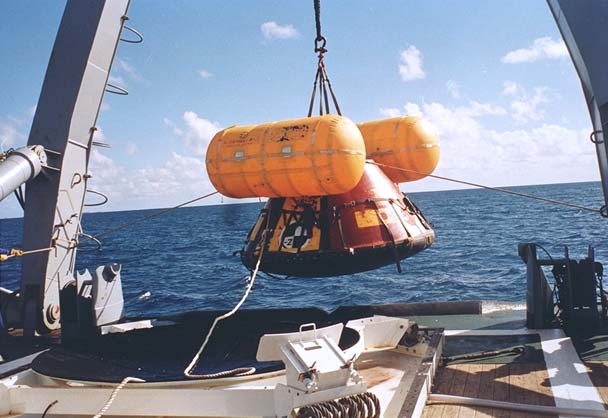 As part of the program, Aerospatiale subcontracted to Alenia Spazio the design of the Descent and Recovery Subsystem (DRS) that would allow the ARD capsule to perform a soft splashdown at the end of its atmospheric reentry and controlled flotation over the ocean. Before the actual rocket-borne test, the qualification of the whole integrated subsystem was performed by means of a high altitude drop test from a stratospheric balloon. This test was performed with a mock-up of the real capsule denominated Qualification Model (QM), which had the same scale, shape and mass properties of the real model. The QM -which can be seen in a cut-away scheme at left- measured 0.279 meters of diameter, 2.037 meters of height and had a mass of 2800 kg. It was equipped with sensors and instrumention that monitored pressure, temperature, accelerations for attitude monitoring, cover separation, shocks due to parachutes opening and QM water impact. The whole electronic system including telemetry and telecommands devices were placed in waterproof boxes. The Parachute Recovery Assembly consisted of three successive stages. First, a 1.07-meter flat ribbon pilot chute is mortar-ejected at 14 km; once inflated, it pulls out the capsule back-cover. Then, a 5.80-meter conical ribbon drogue chute decelerates and stabilizes the vehicle during 78 seconds and finally, a cluster of three 22.9-meter polyconical slotted main parachutes is opened. 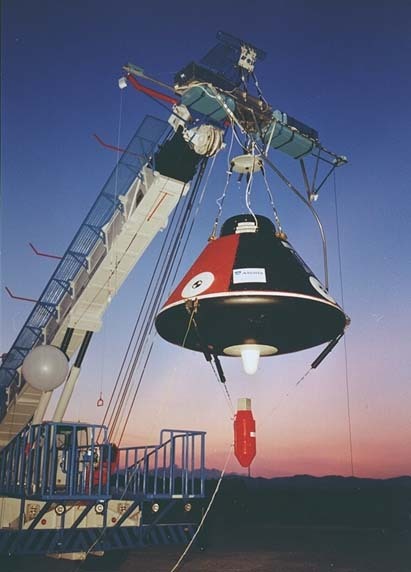 Due to the intrinsec dynamic instability of the capsule during splash down, a special Stabilizer Device was attached to it. It consisted of a low drag axisymmetric body which was attached below the front shield by three vectran ropes and released just before the parachute sequence initiation. The system was developed by the French company SAER under Aerosptaiale specifications. It can be seen clearly in the first picture at right. The nature of the project posed a series of challenges for the balloon launch infrastructure of the Italian Space Agency, which needed to built special hardware and develope special procedures for the test. The gondola used to lift the capsule was developed inhouse by ASI engineers. Also the large weight of the capsule, the payload, the flight chain and the balloon (corresponding to a total ascensional force of 5390 Kg) brought to design and then realize a special set up for the launching crane. This design, stable up to 7000 Kg, allowed to perform safely the capsule release from the vehicle in the worst conditions static and dynamic. Moreover, to avoid oscillations of the capsule flight chain has been projected with special simmetries and ballast has been released by an external guide. Launching procedures have been also reviewed in order to guarantee security and reliability. Two telemetries were on board: one, managed by Aerospatiale, was devoted to capsule and related experiments, and the other, under complete ASI responsability, to the management of housekeeping parameters such as temperature, pressure, trajectory, telecommands status and on board batteries. Housekeeping telemetry, connected to separation interface, allowed the management, under security constrains, of the numerous pyrotechnical devices located on board. As the first part of the flight was to be performed over land, a series of security measures were established, in particular a parachute with a variable cross section (reefing) was designed for use both in the expected descent conditions (just gondola after payload separation) and in the case of a failure or mission abort conditions (gondola and payload together). A mobile telemetry station has been also developed to deal with eventual altitude loss by the balloon and consequent change of trajectory. In case of trouble the mobile station was ready on the ground to follow the balloon, send telecommands, receive and record data transmitted thus avoiding the risk of mission fail. The test was performed in close coordination with aerial and marine Italian authorities. After a nominal launch by dynamic method, the balloon started a slow drift to the east, and after reach ceiling changed his route due west. After a while and to achieve the exact flight level for the launch of the model, 50 kgs of ballast were released, leveling the balloon at a height of 23.2 km. Once over the landing zone near Marettimo island (80 kms from the west coast of Sicily) the capsule was released. It was accelerated by gravity during a 10 km free-fall phase and at 14.7 km of altitude the parachute sequence was triggered at qualifying Mach number and dynamic pressure. The capsule, as planned, landed on the sea at 38º 19' N, 11º 49' E. with an impact velocity of < 6.8 m/s. The whole descent phase lasted 15 minutes and 24 seconds. After the splashdown the parachute cluster was released and two cilindrical floating bags were automatically inflated with helium contained in three bootles inside the canister to allow the QM to mantain a fixed attitude. At 13:00 local time, the recovery ship located and retrieved the capsule. After close examination was verified that all the subsystems were in conditions to be re-utilized. The success of the ARD test contributed to qualify ASI balloon launch facility for heavy payloads (up to 3000 Kg). After the ARD test also local flights and sea retrieval from Milo Base will be improved and all the techniques related will be developed.